Characteristically Roman, the thermae were an important part of social life, where most citizens lived in crowded tenaments without running water or sanitary facilities. 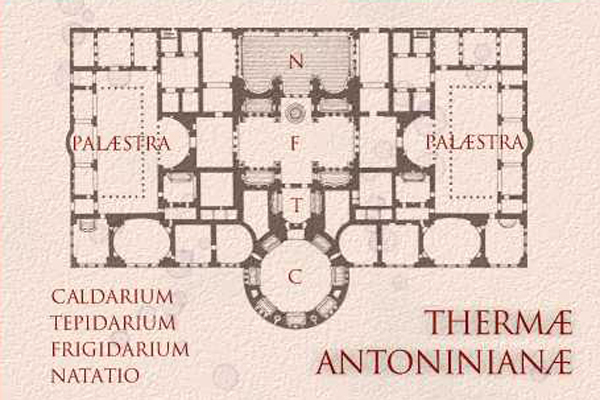 The baths were designed along the short axis: the caldarium or hot bath; a smaller area for the tepidarium or warm bath; the frigidarium or cold bath at the center; and the natatio, an open-air bathing pool. Symmetrically arranged on either side of the baths were rooms for changing, massage, depilation, and medicinal use. From the changing rooms, one would go to the gymnasia and exercise in the palaestra and from there to a sauna to induce an even greater sweat. Then the bather passed to the caldarium, after which the skin was scraped clean with a strigil, and to the tepidarium for a cooler bath and, finally, to the frigidarium for a bracing plunge in a cold bath--which was the regimen recommended by Galen, himself. One could admire the sculpture, swim in the natatio, read at the libraries, walk the grounds, or as Trimalchio does in the Satyricon, be carried off in a litter to a dinner party. The Baths of Caracalla follow the model established by those of Trajan but with several impressive innovations. There is a perimenter, for example, nearly 500 yards square that enclosed almost fifty acres. And the dome that covered the caldarium was almost as large as that of the Pantheon but much taller. Projecting forward of the main building, the large windows in the drum admitted the afternoon sun and faced out onto the gardens. Eight massive columns, one of which is in the Piazza della Trinità (Florence), supported the central hall. 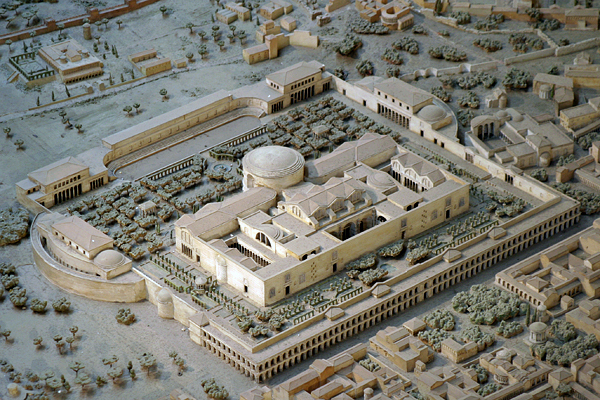 In the Model of Rome, one can see the Aurelian Wall in the upper left and the surrounding portico built by Elegabalus and Alexander Severus.